I usually have this dish on a cool fall or winter night, but it ended up on the table last night and it was very comforting. Feel free to add kale, spinach, swiss chard or tomatoes to the lentils as I usually do. As you can see in the picture, I forgot to put the tomatoes I had bought. It was still very good. 1. In a large pan over medium heat, fry the pancetta in the olive oil for a few minutes until it starts to turn golden but before it becomes crispy. 2. Add the vegetables and stir until they are soft, maybe 5 minutes. 3. Add the chicken broth, lentils, rosemary and bay leaves and stir well. Bring to boil, then cover and reduce to simmer. Cook, stirring once in a while until the liquid is almost all absorbed and the lentils are soft but not mushy. 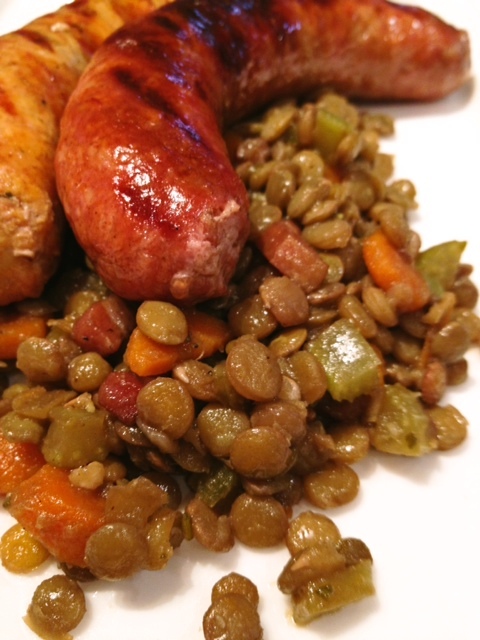 Depending on the lentils you use, it should take anywhere from 25 to 40 minutes. 4. While the lentils are cooking, grill the sausages on the BBQ or cook them in another pan until they are almost cooked through. 5. 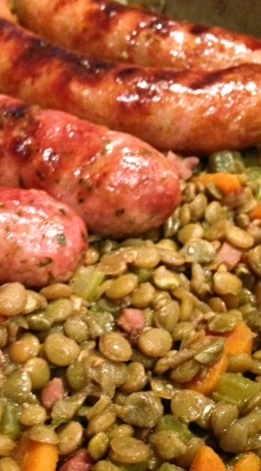 Finish cooking the sausages with the lentils for a few minutes. Add the tomatoes at this stage if using. Taste and adjust for seasonings. You may not need additional salt or pepper. Add one last drizzle of olive oil and serve on warm plates. I kid you not, we’re doing a lazy man’s version of this right now! Yours puts ours to shame. Looks awesome. Thank you so much! This looks awesome! This looks superb–hearty but not heavy. True comfort food.